Among the first tasks of American administration in California was solving the complicated maze of property disputes created by Mexican inspecificity. Defining place with meaning would require several more decades, American geographers, artists, and their technology. This is a story of how it happened, and how it led to some of the most ambitious science and greatest art of 19th-century America. In the decades after Fremont’s explorations, the United States Coast and Geodetic Survey proposed to survey all of America. The USCGS man in San Francisco was George Davidson, whose job it would be to survey the West. The USCGS’ plan was to virtually overlay the land with a geodetic grid, lines of longitude and latitude, that would allow anyone to know where they were in and on the landscape, where their property began and ended. In the West, this meant that the USCGS would have to measure the earth, from the gold-and-timber-rich mountains to California’s flat Central Valley, which everyone realized was the nation’s next agricultural heartland, to cities such as San Francisco and Sacramento. Instead of Fremont’s “somewhere in or near” estimations of place, the USCGS intended to map the land to a specificity of one part in 5,500,000 to an error of less than one inch in 90 miles. It was this accuracy, achieved within two generations of Fremont’s descriptive guesswork, that led to surveyors coining the slyly ironic phrase ‘good enough for government work.’ This is the work from which we get today’s global positioning system. Nowhere was more difficult to geodetically survey than vast, mountainous, and climatically challenging California, a state where atmospheric conditions could be wildly different across relatively minor distances and a place thoroughly interrupted by mountains that blocked views of still more mountains. This was a particular problem because it was imperative to be able to see high points across long distances, 100 miles and more, to do geodesy. In other words, the greatest obstacle to mapping Western land in a way that enabled it to have definable economic and political value was the Western landscape itself. Davidson’s solution was so brilliant that 140 years later, his measurements, enabled by fieldwork conducted between 1879 and 1881, came within 10 millimeters (about a third of an inch) of measurements made with today’s digital instrumentation. Davidson’s work is considered one of the greatest feats of the 19th century geography. Mt. 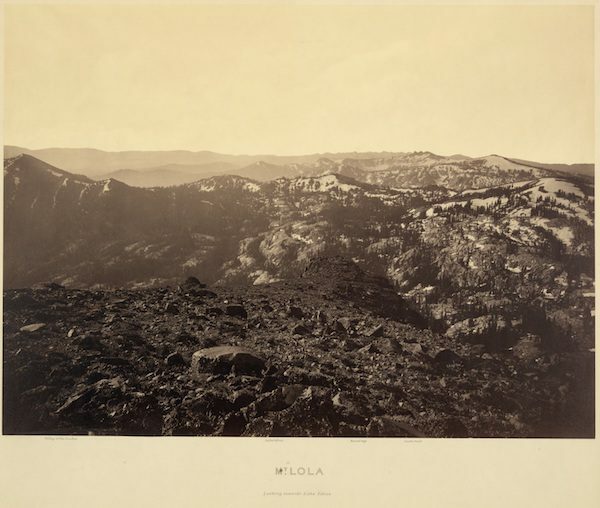 Lola Looking Toward Lake Tahoe, 1879. Here’s how he did it: First, Davidson proposed to superimpose an enormous virtual quadrilateral across the middle of California, with each of the four corners of the quadrilateral being tall peaks from which the other three summits were visible. Then, using precise surveying equipment, Davidson’s teams would take line-of-sight measurements over nearly 200 miles, distances more vast than any human had measured before. First Davidson selected the western-most mountains: Mount Diablo, a 3,849-foot peak east of San Francisco Bay, and Mount St. Helena, a 4,342-foot pile of uplifted volcanic rock at the intersection of modern-day Napa, Sonoma, and Lake counties. Then Davidson and his team studied the landscape to pick the two Sierra peaks that would form the eastern-most quadrilateral tent-poles. They found two mountains that could be seen from both Diablo and St. Helena: Round Top, a 10,381-foot, unusually isolated mountain southwest of Lake Tahoe, and Mount Lola, a 9,148-foot bulbous mountain that is the highest point in the Sierras north of Donner Pass. The two Sierra peaks selected, Davidson prepared to scale each one, to establish camps there and to take weeks’ worth of measurements. He packed three tons of equipment, loaded it onto railroad cars, made arrangements to rent mules, and hired an artist and photographer, Carleton Watkins. By 1879, Watkins was the most famous artist living in the West. Over the previous 20 years, his pictures had motivated the Lincoln Administration to set aside the Yosemite Valley as a preserve, essentially creating the world’s first national park. Other Watkins pictures had given America its first, best views of its new Western lands. They guided business decisions, spurred investment and migration, and informed science, other artists’ work, and more. Davidson’s request to Watkins was both simple and complicated: Take pictures from Lola looking across the Central Valley toward St. Helena and Diablo, and south toward Round Top. Then Watkins was to travel to Round Top and do the same thing. An acute inspecificity about place was simply part of life in the early West. Davidson seems to have wanted these pictures to help him build upon his quadrilateral. Having made measurements from each of the tent-poles, Davidson’s next survey step would be to break his quadrilateral into a series of triangles, triangles that would be formed by highly specific measurements that would allow the Davidson to lay down the most accurate geodetic grid imaginable. The intention of Watkins’s pictures, it seems, was to help the USCGS decide from what other mountain peaks to send crews and from which to take these triangulating measurements. Watkins did as he was asked. Over several months in the late summer of 1879, Watkins hauled around 1,000 pounds of photographic gear—about four dozen or more mammoth-sized glass plates weighing around seven pounds each, a mammoth-plate camera that was nearly the size of a marriage chest, a stereographic camera, several sturdy tripods, many, many casks of chemicals so that he could prepare the glass plates to receive images and then fix those images on them, a dark-tent in which he would do all this work, and so on—from the Central Pacific’s Summit Station to Lola and Round Top, where he made 41 pictures. Watkins typically traveled with one or two assistants, but at both Lola and Round Top he would have eagerly accepted assistance from mules and Davidson’s staff. At Round Top especially, the men would have had to hand-carry every bit of Watkins’s gear up the last 800 or so vertical feet to the summit along a sandy, slippery, steep trail. The last hundred feet would have required carrying material for a while, then putting it down in order to ascend via some hand-over-foot rock climbing, reaching down to pick the gear back up again, and looking for the next place to gain a couple feet toward the summit. Then, when it came time to make pictures, Watkins had to find a way to do so despite a ferocious, steady wind that seems to always blow across Round Top’s exposed summit. “Many difficulties were overcome in securing photographic views,” Davidson dryly wrote in his USCGS report. Watkins’s pictures seem to have been exactly what Davidson needed. They showed the views between the four tent-poles of the quadrilateral with striking clarity. They were pictures that only Watkins, the most skilled landscape photographer in America, could have made. His previous experience working in challenging outdoor conditions, including as a member of the 1870 team that found a glacier on Mt. Shasta—the first discovered in North America at an altitude 4,000 feet higher than Round Top—meant that in a certain way this assignment was not the most difficult of his career. 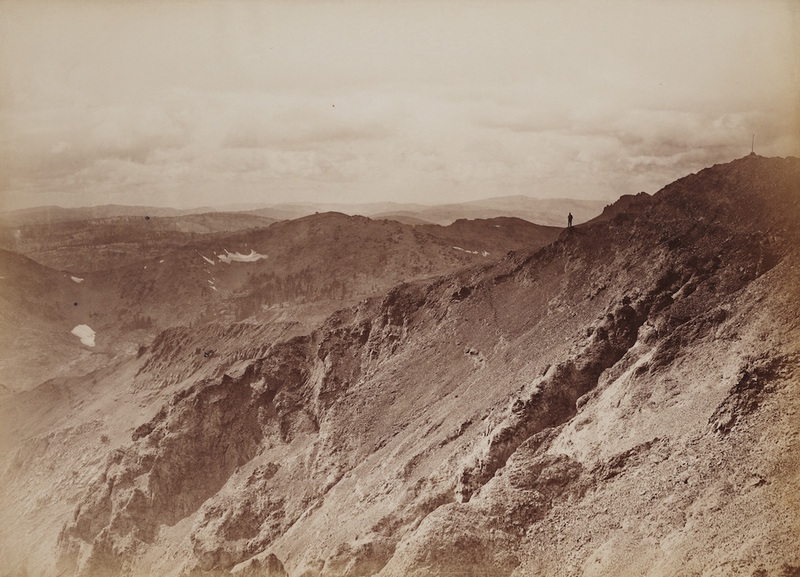 As useful as Watkins’s pictures seem to have been to Davidson, today they stand on their own as the greatest pictures taken from mountaintops in the 19th century. In the several pictures looking out over the neighboring mountain ridges, Watkins manages to build compositions that make it look like saw-toothed ridges are there to pull the eye deeper into the picture, and to encourage the viewer to look deeper into the Sierra. One of them even features a man standing on a distant ridge. That single figure provides both scale and a sense of danger, a revelation of both the vastness of the landscape and the derring-do that working in it often required. Davidson’s mapping of the West was an awesome achievement. Watkins’s pictures both helped to enable it—and transcended it. Tyler Green is writing a book about how Carleton Watkins, the greatest 19th-century photographer and America's most influential artist, helped make the West a part of America. He also produces and hosts The Modern Art Notes Podcast, the most popular audio program about art. This essay is part of a Zócalo Inquiry, Was the Great American West a Lie?, inspired by Ed Ruscha and the Great American West, an exhibition at the deYoung museum in San Francisco. Primary Editor: Callie Enlow. Secondary Editor: Sara Catania. *Lead photo by Carleton Watkins, View from Round Top, 1879. Courtesy of Beinecke Rare Book and Manuscript Library, Yale University. Interior photo by Carleton Watkins. Courtesy of Library of Congress.